Ultra Pro Comic Preserver - Bag/Board Combo. You will never have worry about the board touching your comic! Ultra clear bag holds up to 7" x 10" (17.78cm x 24.4cm) and features flap closure with resealable strip. BCW Current Size - Comic Book Showcase. Manufactured by BCW. The BCW Comic Book Showcase Holder is made of high quality, crystal clear polystyrene and a strong black polystyrene back. Features a 2 piece design, with a wall mountable back. E. Gerber Mylites 2 Standard Mylar Sleeves. The best raw plastic material available for permanent protection and storage. At 2-Mil, these are twice as thick as ordinary Mylites. Not affected by fungus, mold, or mildew, and immune to insects and rodent attacks. The BCW Book Bags are an acid free, archival quality product made of crystal clear polypropylene. - For your Book Bags needs. - Size - 10 x 13. - Crystal clear. CGC COMIC IS NOT INCLUDED . It is to show what our Diamond CGC BAGS™ look like on a CGC comic. Maximum High Clarity Crisp mylar material (archival). You paid a lot for your graded books so let them sparkle and shine! 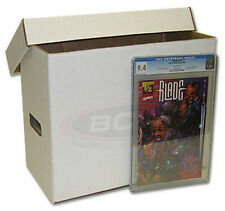 2 BCW Golden Age comic book topload holders. 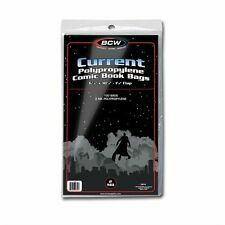 ★ 2pk BCW GOLDEN AGE COMIC BOOK TOPLOADERS ★. (2x) BCW GOLDEN AGE COMIC TOPLOADERS. The PVC used in BCW Toploads contain no plasticizers or stearates. Any unauthorized use is subject to penalty under existing international procedures and laws. 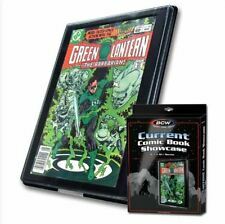 MAX DEFENDER CGC Comic Book Slab Protector Fits thin style slabs. The picture shows the note condition. ☺ The best raw plastic material available for permanent protection and storage. At 2-mil, these are twice as thick as ordinary Mylites. Not affected by fungus, mold, or mildew, and immune to insects and rodent attacks. Holds about 150 comics. Stack up to six high. Heavy duty, acid-free plastic. (Each box uses up to 4 partitions). Includes one black partition. 8 am to 3 pm. 8 3/4 x 12 1/4 x 16 1/2. BCW Comic Book Supplies. - Use with BCW Current Extenders. This bag is a semi- rigid bag and does not require the use of a backer board. But if you do use a backer board be sure to only use certified acid free boards. An RMA number is required, which we will provide to you. Fits both Current and Silver Age comics. 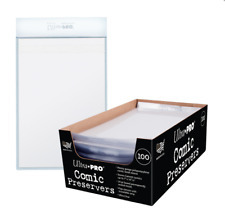 UV resistant and resealable flab closure provides added protection for your comics. Pre-punched 3-hole spine fits in standard 3-ring albums. Our fees, service and organization is top quality. The Max Protection Current Comic Bags are an acid free, archival quality product made of crystal clear polypropylene. The Max Protection Current Comic Backer Boards are made from a full 24 point solid bleached sulfate, coated on one side with a buffered with 3% calcium carbonate, and are precision cut to size. The Max Protection Silver Comic Backer Boards are made from a full 24 point solid bleached sulfate, coated on one side with a buffered with 3% calcium carbonate, and are precision cut to size. The Max Protection Silver Comic Bags are an acid free, archival quality product made of crystal clear polypropylene. E. Gerber Mylites 2 Current Mylar Sleeves. The best raw plastic material available for permanent protection and storage. At 2-Mil, these are twice as thick as ordinary Mylites. Not affected by fungus, mold, or mildew, and immune to insects and rodent attacks. Protect your valuable collection with the best! Ultra Clear 2 mil Material. 100% Archival-safe page. The BCW Stor-Folio is a drop back portfolio box. It is an unequaled transportable comic book storage device. The Stor-Folio will hold up to 15 bagged and boarded comic books, or up to 20 loose comic books. DC Bombshells Short Art Comic Box! BACKER BOARD! Ultra thick 60pt. Crystal Clear PET Board. Thickest and Clearest Backing Boards in the Industry. Film Protector on both sides to protect from scratches - simply peel off before use. Precision Cut and Polished to size. Wall mountable. The Max Protection Comic Book Showcase Holder is made of high quality, crystal clear polystyrene and a strong black polystyrene back. Features a 2 piece design, with a wall mountable back. ☺ Made of high quality rigid PVC. The PVC used in BCW's comic Toploaders contain no plasticizers or stearates. ☺ Holds Silver Age comic books. ☺ Open on the short side. Check Out Our Featured Products. 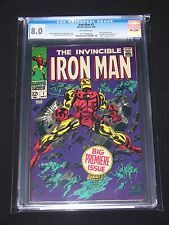 ONE CGC GRADED COMIC BOX By E GERBER! Official Authorized! Each box can hold 28-30 CGC-graded comics. Single Cards - Baseball Single Cards - Basketball Single Cards - Football Single Cards - Hockey Single Cards - Non-Sports Single Cards - Soccer Single Cards - UFC / Wrestling. 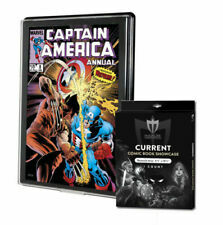 1 Ultra Pro Comic Book One Touch Magnetic Holder Current Size UV Protected. Only need a few bags & boards?. Buy as many as you need! 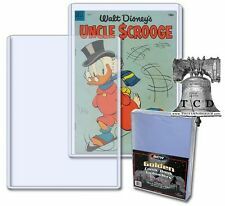 50 - ComiCare Magazine 24pt White Backer Boards + Wrap Fabric - 8-1/2" x 11"
☺ ComiCare Magazine Backer Boards are precision cut and designed to fit snugly inside magazine bags. These boards also fit nicely inside Magazine size Mylar bags from E. Gerber. Holds Current & Silver Comic Books. The PVC used in BCW Top loaders contain no plasticizers or stearates. Holds Current Comic Books. Crystal clear. Each Toploader holds 1 Magazine. 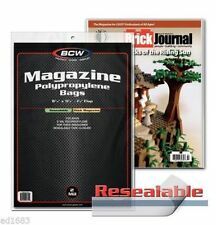 BCW MAGAZINE TOPLOAD HOLDER. Made of High Quality Rigid Plastic. Crystal Clear. The plastic used in these Toploaders contain no plasticizers or stearates. 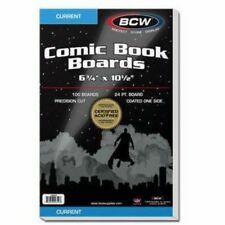 Comic Boards:The Max Protection Current Comic Backer Boards are made from a full 24 point solid bleached sulfate, coated on one side with a buffered with 3% calcium carbonate, and are precision cut to size. The Max Protection Resealable Magazine Bags are an acid free, archival quality product made of crystal clear polypropylene. These bags have a reusable adhesive tape strip on the body of the bag so the collector can fold the top flap over and lock in the magazine. The Max Protection Life Magazine Backing Boards are made from 24 point solid bleached sulfate, coated and buffered on one side with 3% calcium carbonate, and are precision cut to size. The Max Protection Life Magazine Bags are an acid free, archival quality product made of crystal clear polypropylene. They are constructed of white corrugated paper and have a 200 lb. test strength. Each Box holds 30-33 Standard CGC slabs. It is Double wall thick on all sides which makes the box last longer. Each box has the CGC Label on it. The Max Protection Resealable Golden Age Comic Bags are an acid free, archival quality product made of crystal clear polypropylene. These bags have a reusable adhesive tape strip on the body of the bag so the collector can fold the top flap over and lock in the comic. ☺ Made of high quality rigid PVC. The PVC used in BCW's comic Toploaders contain no plasticizers or stearates. ☺ Holds Current (Modern Age) comic books. ☺ Open on the short side. Mylites 2 are 7 1/4" x 10 1/2" with a 1 1/2" flap. Give us a try & you be the judge. To make it simple, You Get 50 Bags with backing boards.